Sen. Marco Rubio is pressing for more answers from President Trump’s nominee for ambassador to Cambodia on his role in formulating the U.S. response to the slaughter of the Rohingya by the Burmese military. The Florida Republican grilled W. Patrick Murphy, the current principal deputy assistant secretary of the State Department’s Bureau of East Asian and Pacific Affairs, on his role in the U.S. policy on Burma in the wake of the Burmese military’s systematic killings of thousands of Rohingya civilians. During a Senate confirmation hearing Tuesday, Rubio repeatedly asked Murphy, a 25-year veteran of the foreign service, what position he took during the internal Obama administration debate on whether or not to impose targeted sanctions against Burmese military officials in response to a brutal slaughter of Rohingyas in October 2016. The actions of the Burmese military have driven 700,000 Rohingya from their homes in the western Rakhine state and has created a refugee crisis in neighboring Bangladesh. “Were you engaged or not in the debate on whether to impose targeted sanctions on Burmese military leaders?” Rubio asked. Murphy responded that he has been a part of “our internal deliberations” in response to these attacks for the past several years but would not reveal his position saying that doing so would “tie the hands” of the Secretary of State Mike Pompeo on the policy going forward. “Deliberations are a constant theme of the shaping of foreign policy, and I’m not really in a position to reveal individual positions, but the results are incredibly important,” Murphy said, referring to the State Department’s decision in August to sanction seven Burmese officials and entities in response to their actions against the Rohingya. “I am fully supportive of those results, and I am fully supportive of ongoing efforts to achieve accountability for the egregious abuses that have been inflicted on the Rohingya people,” he added. 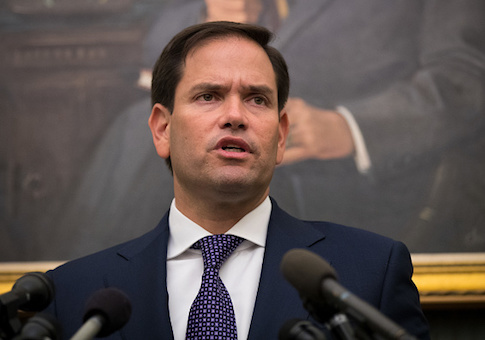 Rubio and other senators on both sides of the aisle are pushing the Trump administration to impose tougher sanctions against the Burmese military in response to its brutal attacks against Rohingya communities since the fall of 2016. During Tuesday’’ hearing, Sens. Ed Markey (D., Mass) and Cory Gardner (R., Colo.) supported Rubio’s line of questioning and pressed Murphy on whether the Trump administration is working on a plan to try to hold the Burmese military accountable that included declaring the atrocities committed against the Rohingya as genocide. The bipartisan concern, led by Rubio, is significant and could spell trouble for Murphy’s confirmation. Rubio also played a role in sinking the nomination of Susan Thornton as the assistant secretary for East Asian and Pacific affairs—a position charged with formulating U.S. relationships with 31 Asian governments—for being too soft on China. At the time, Rubio said she played a role in a policy that “undermined our strategic allies like Taiwan” and “downplayed China’s human rights abuses and its export of authoritarianism” in exchange for smoother bilateral relations with Beijing. China largely supports the Burmese military but has an interest in good relations with Bangladesh, as well as Burma’s stability. The State Department during the Obama and now the Trump administration has tried to pursue democratic reforms in Burma, formally referred to as Myanmar. The country underwent a peaceful transfer of power from the previous military-led regime to a civilian government in 2016, but the military still plays an oversized role in its operations. Several U.S. lawmakers are pushing the State Department to declare the treatment of the Rohingya, a long persecuted Muslim minority, as genocide. Such a declaration of genocide could trigger a more aggressive response from the United States and influence the international community to make the same conclusion. So far the State Department has stopped short, formally determining that the Burmese military’s documented killing of thousands of Rohingya is “ethnic cleansing,” which carries less legal force. Rubio on Tuesday referred to the decision so far to stick to “ethnic cleansing” as an issue of semantics. “In many cases, we’re just playing games with names here—words and titles. In many ways, ethnic cleansing is genocide—it’s just legal terminology for actions perhaps some don’t want to take in the broader geopolitical perspective,” he said during Tuesday’s hearing. Two influential human rights groups on Monday released reports deeming the Burmese military’s violence against the Rohingya “genocide” while the Trump administration has remained silent on the issue even after the State Department in September issued an exhaustive fact-finding report documenting the atrocities in detail. The Holocaust Memorial Museum and the Public International Law and Policy Group, which worked with the State Department on the administration’s fact-finding report, both said the evidence they’ve gathered led to their conclusions that the atrocities amount to genocide. The United States and other countries have made agreements that after the Holocaust they would never allow a genocide to take place again and would take actions to prevent it under the Convention on the Prevention and Punishment of the Crime of Genocide. Ethnic cleansing is a lessor determination that does not carry the same weight under international law. It is legally defined as expelling a national, ethnic, racial or religious group from an area with violence. Rubio also reminded Murphy that Cambodia suffered a genocide at the hands of the Khmer Rouge regime from 1975 to 1979. The post Rubio Grills Ambassador Nominee on Rohingya Slaughter appeared first on Washington Free Beacon.